Thai cooking was one area I had not ventured into, for a long time. I had been reading about Thai food, the glories of their fragrant Jasmine rice, exotic green, red and yellow curries, green papaya salad and the like. Having sampled excellent Pad Thai and other dishes in an Asian fine dining restaurant for my birthday didn’t prove to motivate me enough to create Thai food in my kitchen. About a year ago, Ro happened to be in Bangkok. Since cuisines taste best and sometimes even different in their native places, I egged him to try out Thai cuisine. Being a complete foodie and having eaten a lot of Thai food even in his non-vegetarian days, he would surely be able to tell the difference. Imagine my surprise when I learned that after staying in Bangkok for 4 days, he was about to leave for Mumbai in 4 hours and had not eaten a single Thai dish! He told me that he had been surviving on Pizzas, Pastas and Chinese grub. It was when I reminded him: Ro you cant be leaving Bangkok without eating Thai food! He then decided to have Thai cuisine for lunch at the hotel in which he was staying. Ro requested the chef for a pure vegetarian Thai menu without any oyster sauce and shrimp paste and was served the Thai green curry with plain steamed Jasmine rice and a salad. He relished the Thai Green curry so much that he requested the hotel staff to give him the recipe for me, which they kindly obliged. When I served the Thai green curry for lunch today, he told me that he feels he is in Bangkok. So much so for almost having left Bangkok without tasting any Thai fare! This recipe is courtesy the staff at the Sheraton Grande Sukhumvit hotel in Bangkok. Since I like to eat and serve fresh food, I have modified the ingredients for the curry paste to make one serving of the curry, which should easily serve 4 people. Add the chillies to your liking and if you cant place the Thai green chillies substitute with local green chillies. Method: Blend all the ingredients for the curry paste in a mixer/blender into a smooth paste. Cook the baby corn, potato and broccoli in a cup and a half of water. Heat the oil in a pan or a wok and fry the cashew nuts and red bell pepper until the cashewnuts are golden brown. Stir in the curry paste and fry for a minute or two until the raw smell is gone. Add in the cooked vegetables. Lower the flame and pour in the coconut milk and vegetable stock. Bring to a boil, stirring all the while to prevent splitting the coconut milk. Serve with Thai Jasmine Rice, Plain Rice or Pad Thai. Hi Rustoo, vegetarians generally dont get accustomed to Thai food easily, mainly because of the oyster sauce and shrimp paste. So if you are one, as I remember ask for Thai food without these. And if you get a chance to try this recipe or have someone make it for you, you might like it just like I did! What is the noodle served with this? Plain Pad Thai. You can also serve it with plain rice. I've always wondered why a Thai curry is green – is it the colour of the chillies that decides what 'colour' it is? HI Katie, thanks for your visit and comment. The chillies have very little to contribute to the green colour in this case. The colour comes from fresh coriander and thai basil leaves if one is using them. Hi Anu.. A visual treat, The professional touch and caring for details.. its all there.Am looking forward to more recipes.Simi is going to try the thai dish today…. It is nice to see your site. The recepie is mouth watering.I will certainly try. Hope we will get more and more rfreshing recepies. All the best to you. Yup, as MIL says I did try this to the tee… every bit of the recipe and the specs. It was ABSOLUTELY BRILLIANT! I take no credit for it though. Its like the recipe got translated from you to the cooking pan through you… mystical! Tejas and Amma said it was the most exotic dish they'd tried. And Mihir just loved it! What can I say more than that it was a DIVINE TASTE!!!! Medha kaku: I still owe you the jackfruit biriyani recipe. Simi: The credit should go to you for cooking it up! Great to see you indulging in culinary jaunts. The subtle flavour of the herbs in this curry render a truly saatvik taste to it. Looking forward to more curry recipes! Just came upon this site through the reference given in Kurma's site. Really very well illustrated..hats off! Would love to try this recipe..By any chance do you get these ingredients in India? We're almost namesakes! I also came across your site from Kurma Dasa's site and have really enjoyed reading your posts. Using a combination of your recipe and another vegetarian one, I made the Thai Green Curry and it was lovely, the beautiful photo from your site was my inspiration! I particularly like the touch of cashews, I think it's a wonderful addition that I have not seen in the curries that you can get in Thai restaurants (outside Thailand). Thanks for your posts and wish you well for your journey into motherhood. Divya: All these ingredients are easily available in most cities of India. For this recipe, you can substitute locally available ingedients. 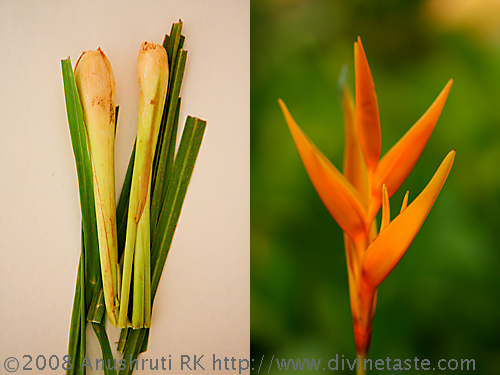 Use dried lemon grass if fresh lemon grass is not available and substitute galangal with fresh ginger. Shruti: Yes…the cashews add magic to this curry. Thanks for your wishes. I have the same opinion with most of your points, but a few need to be discussed further, I will hold a small conversation with my partners and perhaps I will look for you some opinion shortly. I tried your Green curry recipe last night,Bought fresh lemon grass and thai ginger added thai basil leaves, it was just awesome, loved it,by any chance do you happen to have a red curry recipe too. By the way you looklike priya from dil chahta hai movie! I made this curry following this recipe on Valentine's Day. My wife was very impressed. We both loved it very much. Goes great with Thai Jasmine Rice. My husband is a big fan of thai food, i am really glad to have found this authentic recipe from you.. We made this today and he told it tastes truly authentic just like the ones you get at good thai restaurant. Thanks for the recipe !! Could you post a recipe for Pad Thai? 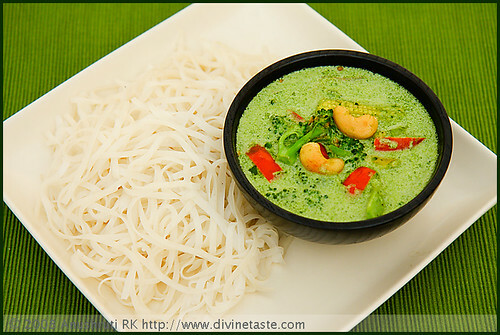 rashmi: Do send in a picture the next time you make it for me to post on divinetaste facebook page. Sure will post a recipe for phad thai. Thanks so much ! The recipe is perfect and the dish turns out great – every time. Could you also share how to make a Thai red curry ? Richa: Ofcourse I can! Will add your request to my recipe que. anuradha: How nice to hear that! Thanks for the feedback. Greetings! I've been reading your website for a while now and finally got the courage to go ahead and give you a shout out from Porter Texas! Just wanted to mention keep up the fantastic job! Tried this recipe (without the kaffir lime leaves) and it turned out perfect. Adore your website, especially for its sattvik aspect. Keep up the wonderful job that you are doing. Can you please post Thai red/yellow curry paste recipes too? Sudha: Thanks. Will keep your recipe request in mind. Great blog. Please share recipe for red curry also. I'm cooking this for my wife tomorrow, I'll let you know how it turns out. I made this yesterday on our anniversary, it came out well but the colour was not as green as yours…..otherwise it was full of flavours. I made pad Thai noodles and bread and butter pudding with strawberries along with it ….my husband was more than happy to have such a wonderful dinner…..I again thank you from the bottom of my heart for sharing such recipes and making my special days extra special!! P.S Thank you again for posting the moong dal waffle recipe… I was one of the requester. Tejal: Thanks for the feedback. I'm honoured that I could make your anniversary special. 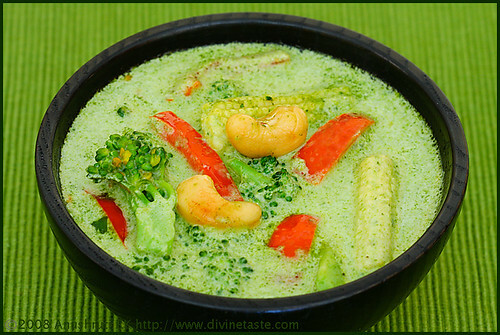 This is the most beautiful photograph of Thai Green Curry I have ever seen! I'll be making this soon! Lalla: I'm flattered! Thanks so much! I'm good Indira..glad your husband liked it.